CHOMINA (Choumin), Montagnais chief of the Tadoussac district; fl. 1618–29. Chomina was known by several other names: Atic; Crapaut; Petitchouan; “La Mer Monte”; Amiscouecan; “Vieille Robe de Castor.” The French called him “Le Cadet,” because of his extreme neatness in dress and fine French manners, and also “Le Raisin” (the Grape), a translation of his Montagnais name, although Le Clercq says it was because he liked liquor. Chomina was identified with the French for several years (1618–29). 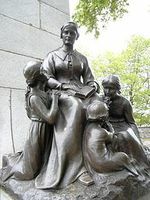 Champlain wrote of him that “we had not known one who was a more faithful and serviceable friend.” He wrote further that Chomina was a man whose word carried weight, who was intelligent, of good judgement and with a good perception of events, not ungrateful, and of great courage. Although closely attached to the French priests, Chomina never accepted Christianity. He “adopted” as a brother Father Joseph Le Caron, who spent the winter of 1618–19 with his people. He gave the priest every assistance, and Chrestien Le Clercq has written that he laboured ardently to build a house for Le Caron, encouraging others of his tribe to help in the project. In the same winter, Chomina’s wife bore a son whom he was determined to call Père Joseph to show his affection for Father Le Caron. At this time, Chomina requested that Father Le Caron take another son, Naneogauchit, then nine or ten years old, to teach him to live like the Recollets themselves. Sagard describes at some length the steps taken and the difficulties that arose before the boy was baptized on 23 May 1627. Chomina, subsequently influenced by non-religious French, did all in his power to entice the boy from the Recollets. Naneogauchit was given the name Louis by Champlain and Mme Hébert [see Rolet], his godmother. The baptism was not public, as had been planned, because of Champlain’s fear of sudden attack during the ceremony. The boy was baptized in the chapel of Notre-Dame-des-Anges with Father Le Caron officiating. Nearly all the French and indigenous people were present, although his father, Chomina, did not attend. The Te Deum was sung, followed by a salute of two cannon and several musket shots. The principal relatives, the captains, the clergy, and the leading French were afterwards entertained at the Habitation by Champlain. A feast was held in the home of Mme Hébert, at which 56 wild geese, 30 ducks, 20 teals, and quantities of other game were consumed. Most of the French brought contributions: the “Messieurs de la Traicte,” 2 barrels of biscuits, 15 or 20 pounds of prunes, 6 baskets of corn, 2 cranes, and more. All went into Mme Hébert’s great cauldron. Soon after, however, Louis reverted from Christianity to his native beliefs. In 1629, Chomina was regarded with some suspicion by his people for having accused another Montagnais of murdering two Frenchmen at Cap Tourmente two years earlier. Champlain released the suspected murderer to Chomina. This was for the French a prudent gesture because of the scarcity of food at their disposal and also because of their dependence on indigenous people during this critical time, when the English menaced New France. It also served to exonerate Chomina in the eyes of his people, a matter of concern to Champlain, who required as a condition of the prisoner’s release that a council, headed by Chomina, should be accepted by the First Nations. Its purpose was to discuss and decide upon matters of mutual concern. Other members of the council were Erouachy, Batiscan, Tessouat (d. 1636), and one other. The indigenous people accepted the plan, although Champlain doubted the sincerity of their spokesman, Erouachy. Ceremonies to establish the council were to be held on the arrival of the vainly awaited French ships. With the fall of Quebec to the English, the council passed into oblivion. This distinction for Chomina caused jealousy among First Nations groups, who were already critical because he had brought food to Quebec for the French when they themselves were in need. However, hope of similar honours led others to give food to the French. As well as assisting in this fashion, Chomina kept Champlain informed about numerous conspiracies the indigenous groups were planning. He and his brothers remained near Quebec throughout that winter, and in the spring, with the consent of the Jesuits, he worked a little plot of their land. His brother Ouagabemat, or Neogabinat (whom Biggar identifies as Negabamat), took Father Le Caron fishing. 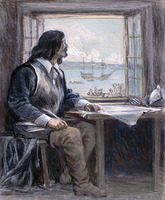 In May 1629, Chomina’s son Louis and two Frenchmen were sent by Champlain to Tadoussac to beg provisions and passage home for some of the French at Quebec. When supplies were perilously low at Quebec, Chomina went to Trois-Rivières seeking corn-meal from the Hurons, who were then arriving for the annual trade. He was allowed a few knives to trade and loaned a pikeman’s weapon, “such was the confidence in him.” His brother set off for the Etchemins, with a Frenchman who lived near that country, in search of powder. Low waters, however, forced their return. Chomina and his brother were the only members of the First Nations who offered to take up arms with the French against the English. According to Le Clercq, Chomina urged that two or three missionaries should retire to the woods and thence make their way to the Tadoussac region rather than abandon the country altogether. Father Le Caron concurred with the plan, but it was forbidden by those in authority during the capitulation of Quebec. Champlain, Works (Biggar), passim. Le Clercq, First establishment of the faith (Shea), I, 30–33, 132–33. Sagard, Histoire du Canada (Tross), I, 63–64, II, 284–85, 307, 498–517; IV, 884–85, 888, 892. Elsie McLeod Jury, “CHOMINA (Choumin),” in Dictionary of Canadian Biography, vol. 1, University of Toronto/Université Laval, 2003–, accessed April 23, 2019, http://www.biographi.ca/en/bio/chomina_1E.html.